New items added to the Blue Box on April 2, 2018. Image courtesy of Halton Region. Outer milk bag. Place the inner bag in the garbage. Plastic overwrap packaging from paper towels, cases of pop, etc. Separate items before recycling them, such as the cardboard and plastic overlay from cases of pop, and receipts from plastic bags. Combine all plastic bags in one bag. You can also recycle metal pots, pans and baking sheets. However, if these items are still in good condition and can be reused, please donate them to a local charity. 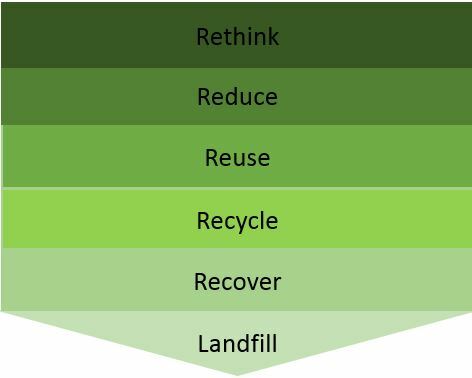 Remember, while recycling is a good practice to follow, it is at the lower end of the Rethink, Reduce, Reuse and Recycle hierarchy. Last but not least, the following change will help reduce litter of light recyclables on windy days! Are you ready for it? You now have the choice of placing your recyclables in a clear plastic bag, in your Blue Box, or both. Image courtesy of Halton Region. Why is Halton Region accepting plastic bags? Halton Region has a new contract with a company that has the technology to break open the clear bags holding your recyclable materials and process the materials for recycling. What should I do if I am not sure how to sort my waste? Visit the Put Waste in its Place online sorting tool at www.halton.ca/waste. Take Action Burlington! Ensure you place your waste in the right place. Collectively we can make a difference!